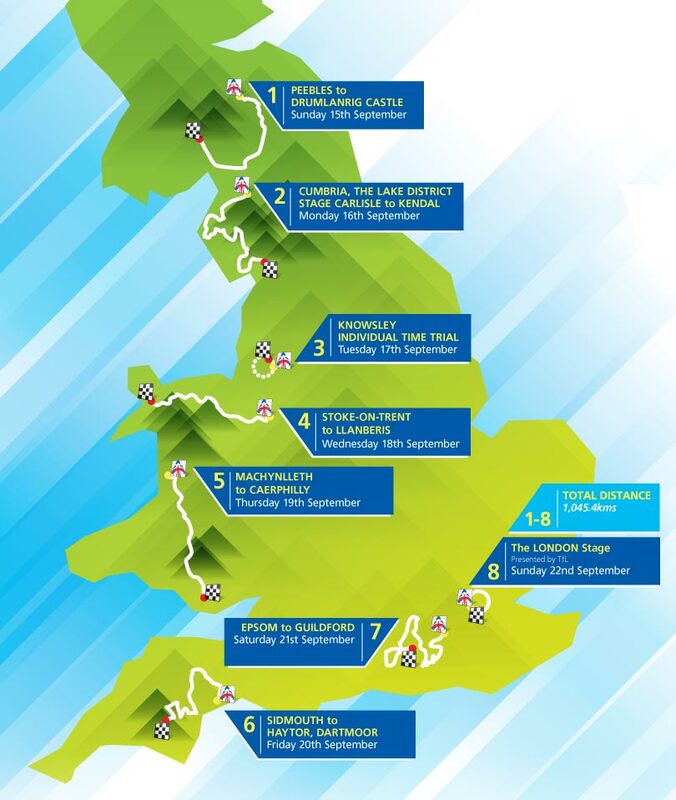 The route of the 2013 Tour of Britain has been announced – and there are several changes to the previous race format, including a 10-mile individual time trial, the event’s first summit finish and a women’s race. This year, the 10th anniversary route visits England, Scotland and Wales. The eight-stage 2013 ToB kicks off on Sunday, September 15 in Peebles, Scotland for the opening stage to Drumlanrig Castle. It’s then south to the Lake District for what should be a tough route from Carlisle to Kendal (September 16) – at 225km, it’s the longest stage in the race’s history. On Tuesday, September 17, the riders will face a 16km (10 mile) individual test against the clock in Knowsley, Merseyside, before starting in ToB favourite Stoke-on-Trent the following day (September 18) as the race passes through Staffordshire and Shrophire and into Wales for a finish in Llanberis. Staying in Wales for stage five (September 19), the riders start in Machnynlleth and travel to Caerphilly for two ascents of Caerphilly Mountain. Then it’s a trip to the West Country on stage six (September 20) where the race sets out from Sidmouth, Devon, and concludes with a summit finish on Haytor, Dartmoor. It’s then east for the closing weekend of the race, with Saturday’s penultimate stage running from Epsom to Guildford and then into London on Sunday (September 22) for a return to the traditional circuit-based finish around Westminster and Tower Hill in the capital. “This will definitely be the most challenging Tour of Britain yet,” said ToB Race Director Mick Bennett. Several WorldTour teams have already signed up for the race: Sky, Garmin-Sharp, Omega Pharma-QuickStep, Vacansoleil-DCM and Orica-GreenEdge. The full team list will be confirmed in the summer. Last year, Jonathan Tiernan-Locke became the first British rider to win the Tour of Britain since its return to the calendar in 2004. Tiernan-Locke signed to Team Sky in the winter from the Endura squad. For the first time, a womens’ race will also take place on the final day of the 2013 Tour of Britain in London (September 22). Better news is that a five-day UCI women’s race will be added to the calendar in 2014. This will be a regional race over five stages, rather than a route throughout the country.